Introduction -- "A Legacy of Exceeding Targets"
Our Class Project Book, "Sports -- A Generation's Common Bond" has been published and the consensus is clear: It is incredible! This is not because I honchoed the publishing; but, it is because 66 classmates figuratively spilled their guts (many for the first time) in essays describing how sport, or even a sporting event -- before, during, or after Dartmouth --has influenced their lives. You will learn things about classmates which you never knew. You will even remember some of the events described by varsity players. You will be reminded of some of life's best lessons... and many of the times in your life when sports played a big role. And finally... you will wish you had written your own story for the book. "If I had known how incredible this book was going to be, I'd have written more." 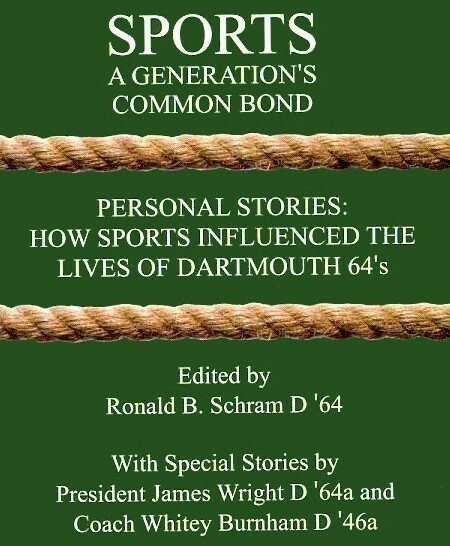 The book also includes special stories by President Wright '64A ; Coach Whitey Burnham, the only 3 sport varsity coach in Dartmouth history; and a sport remembrance by our Class Elder Statesman, Geoff Pitchford. You should get one or more copies of the book for holiday gifts. The book costs $19.95 plus $4.00 shipping & handling per book. 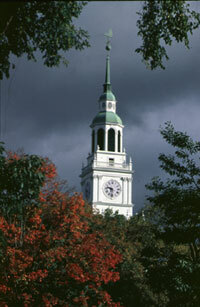 Net proceeds will benefit the Class of 64's Internship Project at Dartmouth's Rockefeller Center. The easiest way -- and the way that best provides $$$ for the Project -- is to send me an email at ronschram@dartmouth64sportsbook with your order. Optionally, you can get it online at www.authorhouse.com ( the publisher) or www.amazon.com or www.barnesandnoble.com. But however you do it, order a copy. You will not be disappointed. "SPORTS: A Generation's Common Bond"